File Name: Wendell A. Metzger of Stromsburg, Nebraska. Notes: Stromsburg is a one-square-mile town about 90 miles directly west of Omaha. 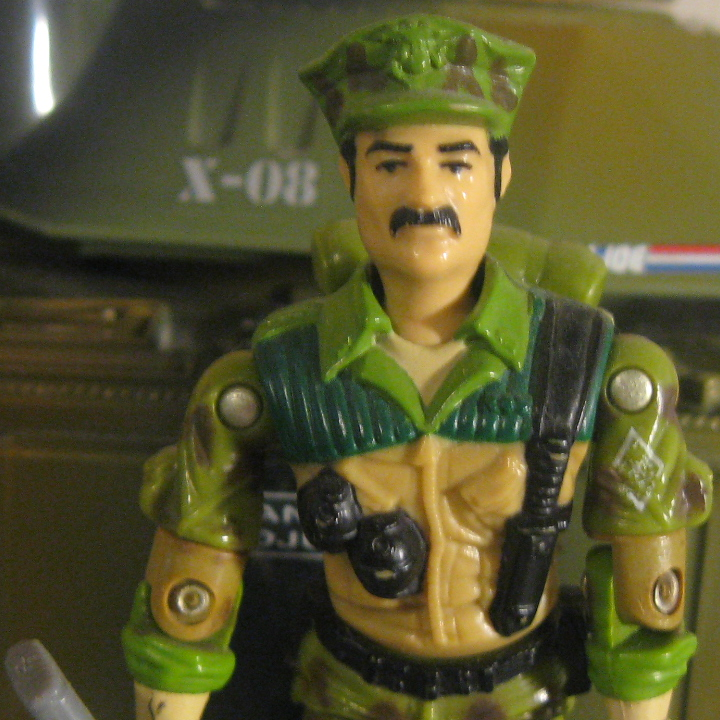 Sunbow's Leatherneck wore his first 1986 outfit, with a standard blotchy green/brown camo pattern and darker green than on the figure, except for Last Hour to Doomsday, where he had green-on-green camo. The series paired him with Wet-Suit, and the two would constantly trade insults related to their respective branches of service. Leatherneck's file name (Sgt. Metzger) is mentioned in the episode The Rotten Egg. Accessories: grey M16 with M203 grenade launcher, no trigger guard (new), light green backpack (new). Leatherneck was the hardest gunny that ever slogged through the mud of Camp Lejeune. Before that, he was the toughest drill sergeant on Paris [sic] Island. Before that, he was the roughest tech sergeant of the 1st Recon B[attalio]n in Viet Nam. Before THAT, he was the meanest corporal in Gitmo. Civilian badness just doesn't count. "He is uncouth, opinionated, and overbearing. And he has no patience at all with the indecisive, the lazy, and the dishonest. Not a man you can like, but one you can trust." Toy Notes: Featured in 1986's Battle Stations commercial, manning the Outpost Defender. Item #6458. The camouflage pictured in the 1986 insert catalog is much darker than on the produced figure. The Leatherneck pictured in the Battle Stations commercial was also quite different. Accessories: grey rifle (86 Leatherneck's), light green backpack (86 Leatherneck's). Leatherneck was the hardest gunny that ever slogged through the mud of Camp Lejeune. Before that, he was the toughest drill sergeant on Parris Island. Before that, he was the roughest tech sergeant of the 1st Recon B[attalio]n in Viet Nam. Before THAT, he was the meanest corporal in Gitmo. Civilian badness just doesn't count. Toy Notes: Boxed in a Toys 'R Us-exclusive set with Claymore, Dial-Tone, Mainframe, Wet-Suit, and an audio cassette. Item #6691. Accessories: black pistol (90 Skydive's), black laser rifle (91 Mercer's), black Uzi (91 Low-Light's), black machine gun (90 Airwave's), orange spring launcher with black trigger (92 Gung-Ho's), black spring missile (92 Gung-Ho's), black knife (88 Hit & Run's), black figure stand (common). Leatherneck was the hardest gunny that ever slogged through the mud of camp Lejeune. Before that, he was the toughest drill sergeant on Parris Island. Men that have gone through his training say they would rather crawl over broken glass than be on his bad side. He demands countless push-ups for mistakes and enjoys leading 30 mile hikes through hot and humid Parris Island swamps. He insists he is a tough disciplinarian because he wants his soldiers to be prepared for the worst, and when you have dealt with Cobra as often as he has, you come to expect the worst. Motto: "There's only one way to train...HARD! So drop and give me fifty!" Accessories: black rifle (92 Duke's), black knife (92 Duke's), dark green helmet (92 Duke's), dark green backpack (01 Double Blast's), black figure stand (common). He's all Marine...tough, bull-headed, and always on the offensive. Leatherneck has never been in a situation where defeat was an option. When he was a Boot at Camp Lejeune, he was so revved up to complete the training that he would awaken his drill sergeant and the men in his barracks before the bugler blew reveille at 4:30 AM. That didn't win him any popularity contests with his fellow Boots, but they soon realized that he was more of a jarhead than all of them combined. Before joining the G.I. Joe Team, Leatherneck served with a variety of Marine units throughout the world. He earned a reputation for being one of the roughest, hard-nosed brawlers in the Corps, ready to fight to the hilt for a fellow Marine. Aside from that, the only other soft spot this guy has is on the top of his head, exactly where his mother accidentally dropped him as a baby. That would explain his overbearing, opinionated disposition. Toy Notes: Carded in a two-pack with Gung Ho. Item #53060. Reissues: Boxed in June 2003 with the Toys 'R Us-exclusive Mobile Command Center. Item #82176. Accessories: green textured combat helmet with attached silver mic (new), black sunglasses with simple earpieces (new), light brown belt with twin holsters and round silver buckle (new). Marines pride themselves on being the toughest and the best, and recon Marines are tougher and better! LEATHERNECK came directly to the G.I. JOE Team from the 1st Force Recon where it is believed that he participated in several Classified operations that are still covered by security restrictions. Sure, he's feisty and loud, uncouth and unsophisticated, mean and unforgiving, surly, antagonistic, and overbearing (and those are his good traits! ), but when COBRA forces pop open a six-pack of firefight, LEATHERNECK can be depended on to do his job with all weapons blazing and no holds barred. "I'd rather be on my feet, or closer to the ground when the tracers are burning by, but the more I drive the DEFENSE MECH, the more I appreciate the fact that it can carry more ammo than I can." Accessories: grey pistol (06 Med Alert's), grey rifle (07 Duke's), black Joe figure stand. LEATHERNECK was the hardest gunny that ever slogged through the mud of Camp Lejeune. Before that, he was the toughest drill sergeant on Parris Island. Men that have gone through this training say they would rather crawl through broken glass than be on his bad side. He demands countless push-ups for mistakes and enjoys leading 30-mile hikes through the hot and humid Parris Island swamps. He insists that he is a tough disciplinarian because he wants his soldiers to be prepared for the worst, and when you have dealt with COBRA forces as often as he has, you come to expect the worst. "There's only one way to train: HARD! So drop and give me fifty!" Toy Notes: Boxed with a tan recolor of the A.W.E. Striker. Item #33558. A green Target-exclusive A.W.E. Striker had previously been released that April and included the figure Crankcase.